Scoot promo code: Save 25% on all flights to all destinations! Low-cost airlines Scoot (low-cost subsidiary of 5* Singapore Airlines) has released new coupon granting up to 25% discount on all flights and all destinations! If you are a budget traveler this is excellent opportunity to fly cheap to Singapore and many other destinations in South East Asia as well as Australia. Remember that this is a low-cost option (From Europe you can use flyScoot non-stop service from Berlin, Germany or Athens, Greece to Singapore). There is only hand bag in base fare. Any other service (onboard meals, checked luggage) for extra (and not low) fee. How to use Scoot promo code: Simply enter the route you are interested in incl. travel dates and click on “Use promo code” box below search button. Enter above voucher and click on “Apply”. Now you can search your cheaper flight. The price you will see is already with discount. The amount you can save depends on selected route and/on travel dates. There is no note about certain amount of discount. Instead you will see “Discount applied” under each of the tariff this Scoot promo code is eligible. See below our sample of applied Scoot voucher. In this case it works on “Fly”, “FlyBag” as well as “FlyBagEat” tariffs. This offer does not work for “ScootBig” thought..
Scoot promo code is valid for all bookings made by 28th of April or until sold out. You can choose travel dates from 1st of October 2019 to 28th of March 2020. Further restrictions and conditions vary by each route. 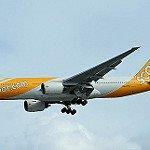 Consider to book greatly discounted flights with Scoot to Singapore, Kuala Lumpur, Denpasar Bali, Bangkok. Krabi, Phuket, Ho Chi Minh City, Manila, Borneo, Sumatra, Austarlia (Perth, Melbourne, Sydney) and more..! Booking sample of applied Scoot promo code: Save 25% on all flights to all destinations! In this case you would book return flights from Athens to Kuching (Borneo) for just €256! In this case you would depart from Greece to Malaysia on 11th of February. Return from this tropical destination in South East Asia back to Europe on 28th of February 2020..